5ft. 8 inches 165 lbs. Wavy black hair, medium dark complexion, brown eyes. Has a scar on back of neck. He's Sicilian, but speaks english albeit with an accent. Bootlegger and runs with the Sicilian alcohol runners and hi jackers. Known in Youngstown, Ohio, New orleans and Chicago. He is a dressmaker by trade and holds various jobs as a general labourer or fruit vendor. When in Chicago he is associated by the authorities as being with the Chicago Aiellos and the Bugs Moran gang. The gangland La Mantias originating from Termini Imerese, (a province of Palermo,Sicily) were in trouble with the law even before hitting U.S. soil. They were accused of banditry and murder. 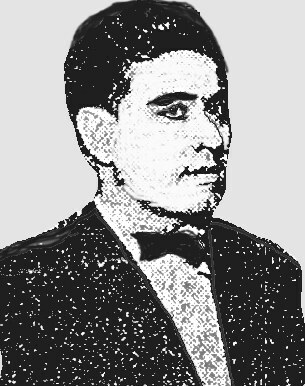 In 1940, Angelo had been charged by the Italian consul with a murder in Sicily around 1922. Brother Pietro had also been wanted for the killing of a jeweler back home. 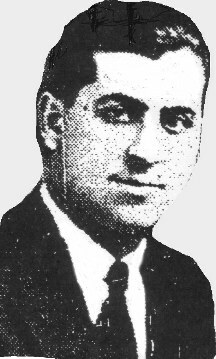 Angelo La Mantia, a 23 year old Milwaukee sicilian hitman makes the news blurbs in November of 1927. Chicago police uncover an assassination plot towards the Capone/Lombardo forces that had been orchestrated by the opposing Joe Aiello gang. Joe had been aspiring to the Unione Siciliana throne and wanted take over of gangland Chicago.By ridding himself of Lombardo and Capone, Aiello sees himself as supreme ruler. Aiello at this point tries anything that will work in his favor.He spreads money around to anyone who will kill the enemy.He hires out of town hitmen who will in turn be killed by Jack McGurn as soon as Capone's intricate system of spies point out the enemy. Capone has newsboys, waiters, shoe shine boys and various other workers in legitimate businesses who keep an eye and ear out for any sign of gangster newcomers approaching the Windy city. Angelo LaMantia has alot in common with Aiello. Both are Sicilians and La Mantia will become part of the Aiello famiglia by dating and marrying an Aiello girl. Angelo LaMantia and four others are arrested with weapons and a cache of dynamite in their possession.At time LaMantia is in the Rex hotel (3142 North Ashland avenue) a known gangster hideout. Police who had raided that Washington boulevard location uncovered two automatic shotguns under the bed. Receipts on La Mantia proved him to be the purchaser of these said weapons and of the newly uncovered ones(several rifles and pistols) on the latest raid at the Rex hotel. La Mantia admits to police ownership of the weapons, but declines to explain their use. Another lair location was 7002 North Western avenue that was also visited previously by police.There the men in blue uncovered thirty seven sticks of dynamite, including fuses and caps. At this location police had got their clue of the Rex hotel and La Mantia's involvement. The fourth location was room 302 at the Atlantic hotel. This particular room looked directly across to former alderman Michael Kenna's saloon/cigar store.This place was a favorite stop over for Al "Scarface" Capone and Tony Lombardo. Capone and Lombardo are put to confronting these men by police and both do not recognize any in the hitmen party (This is gangland custom called Chicago Amnesia). Detective Chief William O'Connor interrogates La Mantia on these locations and their purposes. La Mantia finally concedes that the Aiellos had paid him $ 5,000 as an advance for taking out Lombardo and Capone. It had been substantiated that Aiello had been vying hard for gangland supremacy by paying anyone who would do in Capone or Lombardo. Importing out of town hitmen for $50,000 from other cities such as St. Louis or Cleveland proved fruitless. (They turned up dead). Aiello had even paid a chef at the Little Italy restaurant (4805 West 22nd street) to poison Capone and Lombardo at meal time. The cook was so panic stricken that he divulged the whole plot to the Capone camp. Angelo's brother Pietro is later a suspect in Tony Lombardo's murder. La Mantia's signature on his mugshot card. Angelo La Mantia is born 1904. His story does not end with the Capone/Lombardo plot. Accused of many murders this Sicilian gets away with all of them in court. Angelo falls in love with a girl who is the sister of Frank Aiello Jr. who resides in Milwaukee. Frank Aiello Jr. was a nephew of Chicago gangster Joe Aiello. On the evening of May 23,1931, Frank, who is 35 at the time, is playing cards with his brothers-in-law in the kitchen of his home. Two 12 gauge shotgun volleys entered the curtained window killing Frank instantly. Speculation had arose that it was gangland connected, but nothing proved to that effect. Frank Aiello was beyond reproach, being a family man and a hard working pressman for a Wisconsin newspaper. His polish wife who was pregnant and sleeping at the time of this killing was inconsolable. The sawed off shotgun was found in the side yard. It's serial number 145269 was traced to the American Gun company of New York. Angelo La Mantia was charged with the murder after it was learned that he and Frank Aiello Jr. had been in a heated argument. It was over the fact that La Mantia had took Aiello's sister to Waukegan, Illinois and married her before the Justice of the peace there. Frank Aiello was upset that no proper church wedding was held in front of a priest. In his eyes, this brought dishonor to his sister and family. October 15,1931, Angelo La Mantia along with three others were under indictment for the slaying of two gangsters in Pittsburgh. Philip Spaldino from Pittburgh was indicted for the murder of Antonio Argento who was strangled and burned near Turtle creek. 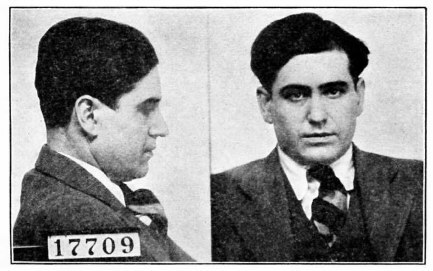 Cimo Romano alias Anthony La Mantia, along with Angelo La Mantia and John Doe, were indicted in the murder of Morris Curran, who was shot to death on June 24,1931. La Mantia using the alias Joseph Rizzo is arrested October 1939 in Philadephia after being wanted for a robbery in Camden, N.J. Fingerprints taken prove that Joseph Rizzo is Angelo La Mantia. Milwaukee Detective Louis Dieden, who had been working on the Frank Aiello murder case, brings a warrant with him to Philadelphia for Angelo La Mantia.LaMantia is brought back to Milwaukee on January 27,1940. Again with luck on his side, an important police witness in the Frank Aiello murder case dies and charges agianst La Mantia are dropped. At this moment, another charge through a telegram shows that the Italian authorities want Angelo LaMantia for a killing that happened in 1922. March 4,1940 Angelo La Mantia 36 asserts that "I am innocent" on the charges of murder and robbery in Italy brought fourth by Milwaukee Italian consul representative Angelo Cerminera.The complaint states the crime occurred between 1923 and 1927. La Mantia states that he left Italy in 1922. He is remanded to the county jail without bail. March 13,1940, the Italian government notifies and instructs U.S. Comissioner Floyd E. Jenkins to drop the case against La Mantia. La Mantia is wanted in Pittsburgh for complicity in another murder there. He waives extradition now being very confidant to beat the rap as he did with all other cases. La Mantia sporting a mustache during his trial for 1931 murder charge. May 13,1940 after being returned to Pittburgh to face old murder charges, Angelo La Mantia is acquitted by a jury for the 1931 murder of Morris Curran. The four student girls who identified La Mantia were now not so sure. Judge Thomas A. Crichton directed the jury to acquit La Mantia. 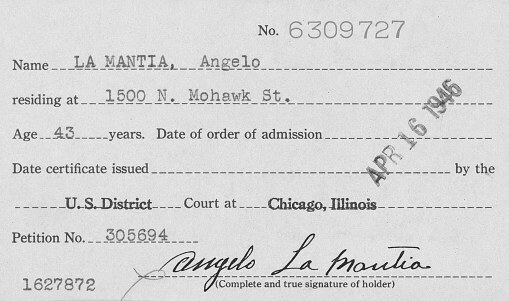 Lamantia's Naturalization Index card, Illinois, Northern District (Eastern Division). La Mantia stays on the straight and narrow after being acquitted and he will live to a ripe old age. He passes away in January of 1985. Lucky guy to say the least!